Thanks, Brent. I'll have to go take a look at that one. Not sure if I've seen it before. It looks to me like they've shortened the bike, making it closer in size to the Harleys. Ha! I won't be showing her this picture. 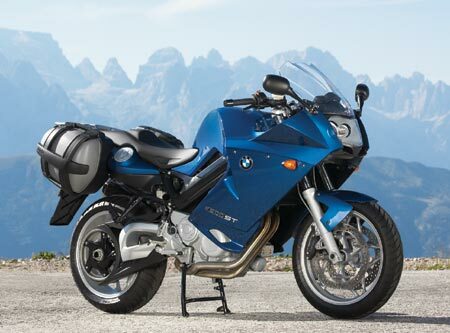 Though, she'll be getting friendly with the F800 in January when we head back down to the bike show. Sounds like a plan. Brent, we normally meet there on the Saturday. Tracy and I usually drive down early Saturday, then stay at a motel in Hope overnight and head home Sunday. We could "van-pool" if you guys want to? Meet in Keremeos, and take you with us in the van? that and the fact that it looks like he's leaning forward. it is shorter, when I sat on them I didnt like it, I felt very cramped, to me it reminded me of the 1500 bike size, where my 1600 was longer in the tank. I do like the design of the bike, but I would of rather seen it with the C14 engine power plant, but like they told us in the meeting, they designed this bike to compete with the Harley-Davidson tourers, and the V-Twin is still the best selling bike design out there, so why buck the tradition, if it works and the consumer wants it thats what they will build. I'd love to give em a shot. Deron, did they dump the meanie platform?